Performance management works hand-in-hand with every phase of the employee lifecycle: learning and development, succession, and even recruiting. Creating a true performance management culture drives employee engagement and retention as well as your bottom line. 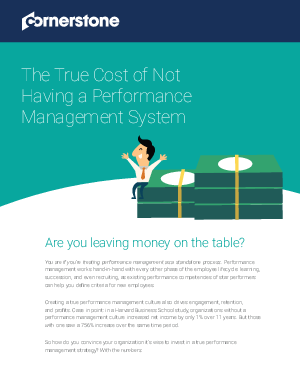 Download "The True Cost of Not Having Performance Management" to learn how to make the case to execs that investing in performance management drives growth. Download the brief to see more proven solutions for building a strong performance management culture!